Previously, importing assets in Godot 2.x required manual maintenance of a separate directory with source assets. Without doing this, it was impossible to specify how to convert and change import flags for textures, audio files, scenes, etc. 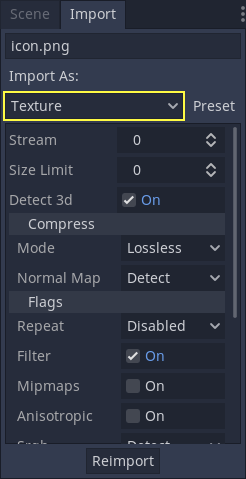 In Godot 3.0, we use a more modern approach to importing: Simply drop your assets (image files, scenes, audio files, fonts, etc) directly in the project folder (copy them manually with your OS file explorer). Godot will automatically import these files internally and keep the imported resources hidden in a res://.import folder. This allows changing all the import parameters transparently. Then, after adjusting the parameters, press “Reimport”. These parameters will only be used for this asset and on future reimports. 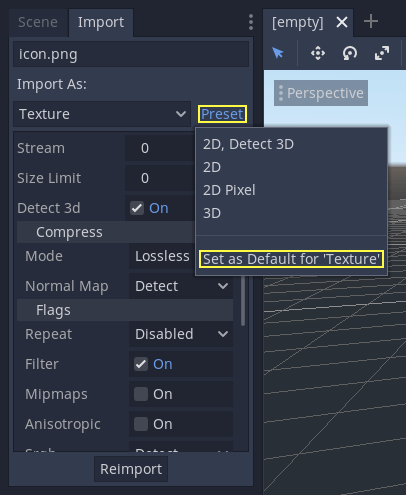 Changing the import parameters of several assets at the same time is also possible. Simply select all of them together in the resources dock and the exposed parameters will apply to all of them when reimporting. When the MD5 checksum of the source asset changes, Godot will perform an automatic reimport of it, applying the preset configured for that specific asset. Importing will add an extra <asset>.import file, containing the import configuration. Make sure to commit these to your version control system! If any of the files present in this folder is erased (or the whole folder), the asset or assets will be reimported automatically. As such, committing this folder to the version control system is optional. It can shorten reimporting time when checking out on another computer, but it takes considerably more space and transfer time. Pick your poison! This is a very simple workflow which should take very little time to get used to. It also enforces a more correct way to deal with resources. There are many types of assets available for import, so please continue reading to understand how to work with all of them!